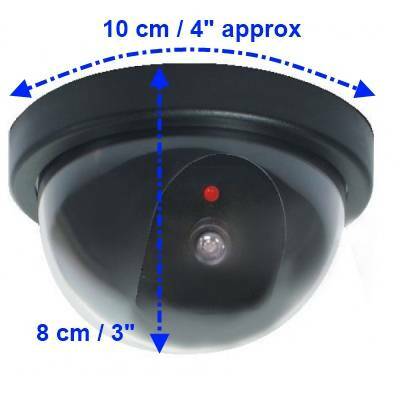 Round Dummy Fake Camera With Led Outdoor / Indoor Security CCTV – Innova Brands Ltd. These easy to install dummy cameras are the ideal deterrent. Help protect your home, shed, garage, office etc. It looks exactly like the real thing. It can obviously be used without batteries just as a deterrent without the flashing LED. The casing is tinted like normal dome cameras to look like there is a camera inside. Very effective way to help ward off intruders. Installation is easy as no wiring is necessary, just insert 2 x AA batteries in each, use the two supplied screws to secure to the ceiling and away you go. Installation – 2 keyhole shaped screw holes on base of each one.